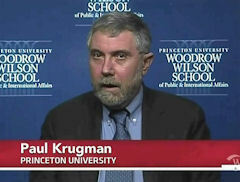 For offensively exploiting tragedy for political gain after the shooting of Gabrielle Giffords and upon the 10th anniversary of the World Trade Center attacks, New York Times columnist Paul Krugman was named a big winner in Media Research Center's 2011 Best of Notable Quotables. For his habit of offensively exploiting tragedy for political gain, New York Times columnist Paul Krugman was a big 'winner' in Media Research Center's 2011 Best of Notable Quotables, posted today. Krugman garnered 'honors' for 'Quote of the Year,' for his notorious post on the morning of September 11, 2011, the 10th anniversary of the World Trade Center attacks. What happened after 9/11 - and I think even people on the right know this, whether they admit it or not - was deeply shameful. [The] atrocity should have been a unifying event, but instead it became a wedge issue. Fake heroes like Bernie Kerik, Rudy Giuliani, and, yes, George W. Bush raced to cash in on the horror. And then the attack was used to justify an unrelated war the neo-cons wanted to fight, for all the wrong reasons....The memory of 9/11 has been irrevocably poisoned; it has become an occasion for shame. And in its heart, the nation knows it.